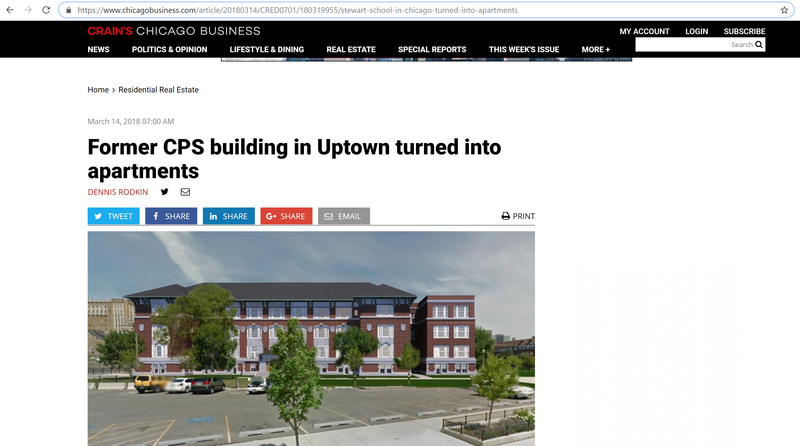 A former school building in Uptown has been fitted out with 64 apartments that will begin leasing to tenants March 16. Built in 1905, the former Graeme Stewart School on Kenmore Avenue was designed by Dwight Perkins, who at the time was the Chicago Board of Education's chief architect. He also designed Schurz and Lane Tech high schools, among many other buildings. Stewart was one of 49 Chicago Public Schools facilities shut down in 2013. Units in the building have vintage features intact, including arches and ornate ceiling details in the four apartments made out of the former auditorium, blackboards on the walls of some apartments and numbered classroom doors in others.